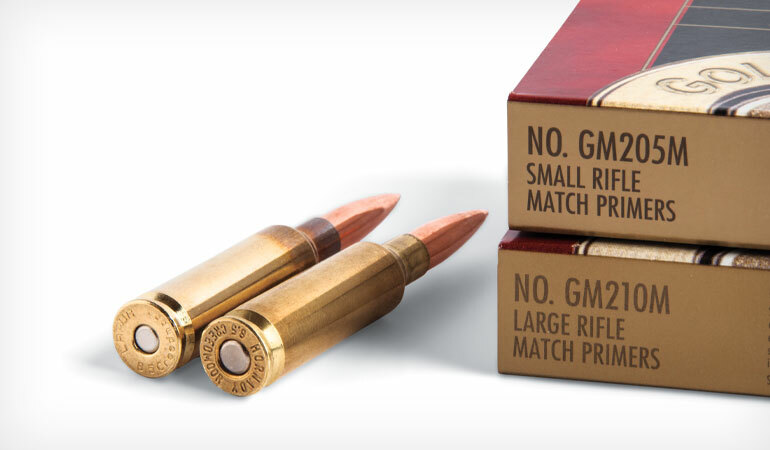 Small Rifle primers leave case heads stronger, and brass lasts longer. Large Rifle primers ignite propellant more reliably and consistently in extremely cold temperatures. A year or two back, Lapua began offering 6.5 Creedmoor brass, and interestingly, it introduced its brass with Small Primer pockets—to the acclaim of precision competitive shooters and to the dismay of traditional propellant companies. Starline and Alpha Munitions also now offer 6.5 Creedmoor brass formed with Small Rifle primer pockets. Advantages of using a Small Rifle primer rather than the typical Large Rifle version are twofold. Use of the smaller, less aggressive cap can result in better consistency, particularly in the form of tighter standard deviations. While this matters little inside common hunting distances, it’s a big deal to shooters reaching past a half-mile, where a mere 20-fps difference between shots can equate to inches of vertical impact difference on the target. Additionally, a small primer pocket leaves more material intact than a large primer pocket. The case head is left stronger and less susceptible to pressure-caused deformation. Handloaders searching for the last iota of long-range performance can push bullets faster—using aggressive charges on the cusp of safe pressure limits—without loosening primer pockets. As a result, savvy competitors with long-barreled match rifles can achieve muzzle velocities a solid 100 to 200 fps faster than typical factory-ammo speeds with a given bullet. Only experienced handloaders should attempt this. Always start low, work up slowly and carefully until you see early pressure signs, and then back off a bit. Master riflesmith and PRS shooter Clayton Smith has pioneered a unique 7mm wildcat, the 7mm SAW, that showcases the advantages of the Small Rifle primer pocket. Formed from Lapua’s .308 Win. small-pocket Palma brass, it features an “improved” profile with a sharp shoulder angle and little body taper. Because the Small Rifle primer pocket enables the case head to maintain integrity while operating at chamber pressures in the upper spectrum, the little hotrod pushes 7mm bullets to unprecedented speeds for a short-action, standard-diameter cartridge. The advantages of Small Rifle primer pockets in standard-size centerfire cartridges don’t come free. In the May issue of RifleShooter’s sister magazine Shooting Times, handloading editor Lane Pearce addressed potential pressure issues related to the use of small pockets in standard-size cases, and he went so far as to advance some stark advice against using them except in specific circumstances. If you can hunt up a back issue, it’s worth a read. When temperatures plummet, propellants become increasingly difficult to ignite evenly, particularly those made of a double-base compound containing nitroglycerine. There goes the added consistency you gained by using a Small Rifle primer. Stubborn ignition could theoretically go so far as to cause a slight hangfire in extreme cold. It’s worth noting that one of my favorite 6.5 Creedmoor propellants, Hodgdon’s 4350, is single-based, while another, Alliant’s Reloder 17, is double-based. A quick call to the manufacturer will help determine whether your favorite propellant flavor is single- or double-based. Rarely are long-range matches held in truly cold conditions. Most are scheduled during spring, summer and fall months, and temperatures range from balmy to scorching. Cold-induced reluctant ignition isn’t commonly an issue for competitors. For hunters, however, opting to use standard-size rifle cases perforated with Small Rifle primer pockets is usually a poor decision, unless they live in mild climates and rarely hunt in temperatures below freezing. Using standard Large Rifle primers ensures reliable ignition in just about any temperature. The second downside is obscure but presents a potential safety issue. As Pearce outlines, if the initial petite flash of a Small Rifle primer fails to instantly and fully ignite a charge, theoretically the primer could bump the projectile forward into the throat. If the chamber throat is really rough, it could stick momentarily as the powder ignited and pressure built before breaking free and scooting down the bore. We’re talking nanoseconds but potentially enough to allow chamber pressure to spike. However, if Lapua is confident selling standard-size cases made with Small Rifle primer pockets, I’m confident using them is safe in pretty much all conditions. Plus, some of the most savvy hand­loaders and shooters in the world—Palma competitors—regularly choose Small Rifle primer pockets in the .308, which has about seven percent greater propellant capacity than the 6.5 Creedmoor. To put on paper the accuracy and consistency differences—significant or not—between using Large and Small Rifle primers with both single- and double-based propellants, I handloaded several batches of 6.5 Creedmoor test loads with 142-grain Sierra MatchKing bullets. To eliminate as many variables as possible, I used Federal Gold Medal primers in both sizes. Cases primed with the Large Rifle version were weight-sorted, neck-turned Hornady; cases primed with Small Rifle caps were new, untouched Lapua brass. My hope was accuracy levels would help me isolate and showcase differences between the handload types, but the results were so similar as to be inconclusive. The two H4350 loads averaged 0.38 inch and 0.40 inch, with honors going to the Large Rifle primers. However the difference is well within my human margin of error, and those averages could just as easily swap were I to repeat the test. Standard deviations were exactly the same: five fps. The only difference was a 20-fps velocity increase with the Large Rifle primers. To my surprise, results with the double-base Reloder 17 powder were twinlike also. Group average was within .01 inch. Standard deviation did favor the loads primed with Large Rifle caps but by the slimmest of margins—six versus seven fps. And this time, the Small Rifle primers turned in the higher muzzle velocity. Based on this test, I have to conclude that as long as you use consistent, well-prepped brass, primer size matters little. Large Rifle versions will be more reliable in extreme cold. Small Rifle pockets will stay snug a bit longer if loaded hot. Aside from those two simple caveats, either will serve yeoman’s duty.